U.S. consumers have increasingly embraced the new "sharing" economy, where individuals, rather than businesses, sell services to other individuals. These peer-to-peer (P2P) transactions are conducted online, and are facilitated by intermediaries such as Airbnb, Uber and TaskRabbit, to mention just a few of these new internet-based "platforms." The personal nature of the transactions might make it easy to forget about the business side of buying, selling or renting. This includes how to protect yourself should anything go seriously wrong. Whether you're renting your home to a traveler, making extra cash giving rides in your car, getting paid to do a household project or selling something you made, you need to make sure you have the insurance coverage necessary to allow you to take advantage of the sharing economy without taking on significant financial risk. Note: New types of P2P services are cropping up all the time. Each different type of sharing exposes you to potential liability and property risks, which you should consider and protect yourself against before participating. In most cases, your insurance considerations will be the same when engaging in money-making activities as a non-employee (independent contractor or business owner), regardless of whether you do so through a "sharing economy" intermediary (platform) or not. There are a number of web-based services—Airbnb, VRBO and HomeAway, for example—that facilitate short-term rental arrangements between strangers. Anyone can register with the services, either offering or looking for a private home or a room to rent. The amount of vetting done by the services varies, from some (Airbnb) to none (VRBO and HomeAway). User reviews about hosts and guests are intended to help you do your own vetting. When you're the host: It may sound like an easy way to make extra income, but renting out your home, or a room in it, is not without its risks. There are enough stories of "guests" who have intentionally vandalized their host's property, stolen from them or used the residence for illegal purposes that you should enter into any rental arrangement with caution. Even otherwise ethical tenants can cause damage simply through carelessness: They leave a faucet running and cause water damage to your downstairs neighbor's apartment, they leave a door unlocked and your home gets burglarized, or they leave the stove on or the fireplace unattended and start a fire. Injuries can happen too—a fall down the stairs, say, or an accident in a pool, hot tub or home gym. Insurance companies sell homeowners and renters policies based on how they expect a property to be used and the level of risk associated with that. Renting out all or part of your home increases your—and the insurance company's—exposure to a claim. According to the Insurance Information Institute (III), you might be covered by your standard homeowners or renters policy if you only occasionally rent out your home (see What Type of Insurance Do I Need If I'm Renting Out My Home?). But even here, your insurer might require advance notice or the purchase of an "endorsement." (An endorsement, or rider, is a written addendum to an insurance policy that alters the policy's coverage, terms or conditions.) If you rent out your space more frequently, your insurance company could consider it a business and, as such, require that you purchase a business policy—specifically, either a hotel or a bed and breakfast policy—or a landlord's policy. If you use a homesharing platform to rent out your space, the company might provide you with some protection. For example, according to the company website on 4/10/17, Airbnb provides Host Protection Insurance, which provides $1 million in primary liability coverage in the event of a third-party claim of bodily injury or property damage related to an Airbnb stay. (Primary means that this coverage applies first, before any coverage provided under your personal policy.) Examples of covered claims the company offers on its website are: a guest suing their host after breaking their wrist in a fall in the home; a guest suing the host and the host's landlord after injuring himself on a broken treadmill in the apartment building gym; and a resident suing a host and the owner of the building when a short-term guest drops his suitcase on the resident's foot in the building lobby. Airbnb also offers a Host Guarantee program, which protects hosts for up to $1 million in damages if their places or possessions are damaged by a guest. There are exclusions (for example, valuables aren't covered), and Airbnb encourages hosts to review and understand the terms of their own personal insurance policy and to be aware that not all personal policies will cover property damage or loss caused by a paying guest. While Airbnb offers its users some protection, other companies may offer less coverage or none at all. (Some, like VRBO and HomeAway, offer optional insurance to participants for a fee.) A company's insurance offerings and policies regarding such protection are voluntary and can change at any time. Some experts recommend only opening your home to guests who can prove they have their own homeowners, renters and/or personal liability insurance. Then, if your property were damaged, you could file a claim under their policy (if their coverage extends to such types of claims). This provides an added—but not guaranteed—source of protection. The best way to avoid an uncovered loss is to consult with your insurance company or agent before inviting a paying guest into your home. In addition to making any necessary adjustments to your current coverage, your insurer may recommend an umbrella liability policy. Umbrella coverage kicks in after you reach the limit of your underlying auto or homeowners/renters policy, up to the umbrella policy limit, which is typically an increment of $1 million. It might sound unaffordable, but an extra $1 million in liability coverage can cost as little as a few hundred dollars per year. When you're the renter: Before renting someone else's home, you should investigate how you would be covered if you damaged the property or were responsible for someone else getting hurt while staying there. Your own homeowners or renters policy would probably cover a claim against you for damage you cause and may also provide you with liability coverage in the event of accident or injury, but because policy terms vary, the best way to be sure is to ask your insurance carrier before you rent. There are a lot of opportunities to make money using your personal vehicle. Understand the risks, responsibilities and insurance options for each before engaging. When you're the driver: The potential to earn hundreds or even thousands of dollars a month has lured droves of drivers to Uber, Lyft and similar ridesharing services, where those needing a ride can use a mobile app to summon a car driven by someone who has signed up to provide paid rides in his or her personal vehicle. While a seemingly simple way to put more cash in your pockets, you might be putting your financial wellbeing in jeopardy if you take paying passengers without the right insurance coverage. The typical personal auto insurance policy is not designed or priced (underwritten) for commercial activity. That means that your claim might be denied and/or your policy canceled if you use your car to make money and your insurer finds out. You might think it's worth the risk—you can always go out and get another policy, right? But drivers whose insurance has been cancelled are considered "high risk," and your future premiums could be much higher. Uber and Lyft both provide some insurance coverage for participants. However, the companies still require drivers to have their own personal insurance coverage, so you can't avoid having your own policy. For insurance purposes, the ridesharing timeline is divided into three periods: Period 1 is when you are logged in to the app and waiting for a ride request; Period 2 is when you have accepted a ride request but don't have the passenger in your car yet; and Period 3 is when you have a passenger in your car. Both Uber and Lyft provide primary liability coverage for their drivers during Periods 2 and 3. Your car is hit by an uninsured driver, injuring both you and your passenger. The rideshare company's $1 million in uninsured/underinsured motorist injury coverage kicks in, paying for injuries up to $1 million. The company's collision coverage pays for the damages to your car, less the company's deductible ($1,000 for Uber and $2,500 for Lyft), if you carry collision on your own personal policy (even though your personal policy does not come into play here). You cause an accident while you have a passenger in the car. The rideshare company's $1 million liability coverage kicks in to cover the passenger's injuries and its collision coverage pays to repair your car, less the deductible of $1,000 (Uber) or $2,500 (Lyft). The rideshare company's coverage does not cover the injuries you sustain (a broken leg that requires surgery), and neither does your own personal auto insurance policy. During Period 1, when you are logged in and waiting for a ride request, Uber and Lyft provide much lower—contingent (secondary) in some states, rather than primary—liability limits: $50,000/$100,000/$25,000 (bodily injury up to $50,000/individual/accident with a total of $100,000/accident and up to $25,000 for property damage), but only if your personal policy denies your claim. Some states, including California and Colorado, have made primary liability insurance during Period 1 a legal requirement. In response, Uber and Lyft made their driver liability coverage "primary" (the one that pays first) in those states in order to comply with the law. The companies provide no collision coverage during this period. When the app is off, you would, of course, have no insurance coverage from the rideshare companies. The exact types and amounts of coverage can vary across companies and can change at any time. You are logged in to the Uber or Lyft app, waiting for a ride request, when you strike a bicyclist that rides in front of your car. If you live in a state where Period 1 insurance is contingent, you must report the accident to the company that provides your personal auto insurance. The rideshare company's Period 1 coverage will kick in only if your personal insurance denies the claim. If you live in a state where Period 1 coverage is primary, you would file a claim with the rideshare company. If the rideshare company's coverage applies, it would pay for injuries to the bicyclist, as well as damages to the bicycle, up to the policy limits ($50,000/$100,000/$25,000). It would not pay for your injuries or damage to your vehicle. To fully protect yourself at all times, you would need your own insurance policy that would allow you to participate in ridesharing (in other words, the insurer wouldn't cancel your policy if it found out you were taking paying passengers) and fill in the coverage gap during Period 1. Without it, in an accident that is your fault, you would have to pay for repairs and your own medical bills out of pocket and would be responsible for any liability claims that exceeded the rideshare company's lower Period 1 coverage limits. a rideshare-friendly personal policy, which doesn't offer extra coverage but doesn't cancel or otherwise penalize you for being a rideshare driver. Insurers are responding to the booming sharing economy by offering new products—hybrid policies—for participants. Not all companies are on board yet, but, according to the NAIC, several insurers have developed products to fill gaps. Coverage types and limits vary. For example, The Rideshare Guy blog reports that some policies will even cover you during Periods 2 and 3 so you won't be subject to Uber's $1,000 and Lyft's $2,500 collision deductible. The best way to find out if your current personal auto policy will cover you while ridesharing is to ask your insurer or broker. However, there have been reports from some consumers that their policy was canceled for either being open about ridesharing or for being secretive and getting found out. So the best time to get information is before you start driving for pay. If you've already started, you might want to first try to learn about your insurer's general attitude about ridesharing (for example, if it offers hybrid policies or if there are reports of it dropping rideshare drivers). An online search for the insurance company name plus "ridesharing" should be helpful. The Rideshare Guy blog also gives a general idea of which companies insure rideshare drivers, and provides a list of insurance company offerings for rideshare drivers by state. NerdWallet's "Rideshare Insurance for Drivers: Where to Buy, What It Covers" is a similar resource. While your choices, if any (availability varies by state), may be limited, you should shop around when possible, just as you should for all insurance. Be aware that if you get into an accident during Period 1 and contact your insurance company (you would contact Lyft or Uber during Periods 2 and 3 unless you had a commercial or ridesharing personal policy), the representative will most likely ask you if you are an Uber or Lyft driver. When you're the passenger: View Uber's and Lyft's driver requirements so that you understand how you are being protected and can make a decision about using such services. Among other qualifications, both Uber and Lyft require that drivers be over 21, be licensed for at least one year with a clean driving record, pass a criminal background check and have insurance. They also have vehicle requirements related to safety, comfort and overall condition. Both Uber and Lyft give passengers the opportunity to rate their drivers. In theory, this should help weed out unsafe drivers, but the system would not necessarily benefit you if you were one of the driver's first passengers. When you're the car owner: Peer-to-peer carsharing services such as Getaround, Turo (formerly RelayRides) and JustShareIt enable car owners to rent out their vehicle to someone who needs one. Learn more in ValuePenguin's "How Car Sharing Affects Your Auto Insurance" and in NerdWallet's comparison of P2P car rental services. When you're the renter: When renting a car from a peer-to-peer carsharing service, unless specifically excluded, you should be protected by your own auto insurance just the way you would be when renting from a traditional car rental agency. The major P2P car rental companies also provide supplemental (secondary) coverage, which would be primary coverage for renters who don't have their own auto insurance. Learn more in WalletHub's "Car Sharing Insurance: For Zipcar, RelayRides, and Others." If you'll be using a credit card to pay for your rental, check with your credit card issuer to see what additional rental car coverage is provided—usually some damage and theft coverage, but not liability. Get coverage information directly from the credit card company, in writing. Learn more at the Insurance Information Institute's "Rental Car Insurance" page and in CreditCards.com's "Renting a car? Know whether your card adds insurance." The limitations of personal auto policies apply to any type of commercial activity. That includes making deliveries, whether for a service such as DoorDash, Postmates, UberEats or Amazon Flex, or for the local pizza parlor. To ensure you're protected, find out what insurance, if any, the company provides its drivers. For example, in early 2017, Amazon Flex was offering couriers $1 million in primary liability coverage, $1 million in uninsured/underinsured motorist coverage, and $50,000 in comprehensive and collision coverage (if you already have some amount of comprehensive/collision coverage on your personal policy) while delivering packages, picking up packages and returning undelivered packages. (New York drivers don't qualify for Amazon Flex's insurance coverage because they are required to carry their own commercial insurance.) Of course, Amazon Flex coverage can be changed or canceled at any time. Other companies that connect delivery customers and drivers may offer less—or no—coverage. Be aware that rideshare insurance, if you buy it, may not necessarily cover you for delivery driving—ask about delivery-specific insurance products, or products that cover you for ridesharing and delivery driving if you do both. Another name for the "sharing" economy is the "gig" economy, which comes from the entertainment industry, where a gig is a short, one-time professional engagement. Probably the best known of these gig intermediaries is TaskRabbit, which connects people who need chores, errands and projects done with freelancers who can do them—sometimes the same day. Taskers, as those getting gigs through TaskRabbit are called, set their own schedule and rates. Those looking to hire someone choose a tasker through the app based on expertise, pricing, availability, etc. Payment is processed through the app. When you're the tasker: You might wonder what could possibly go so wrong with a gig that it might put your financial wellbeing in jeopardy. Consider what could happen if you were hired to put together some bookshelves and you accidentally toppled the completed seven-foot shelf onto the client's home theater system and/or nearby sleeping child. Generally speaking, if you injure someone or damage something while hired for work, the liability claim would not be covered by your own renters or homeowners insurance policy because personal insurance policies don't cover business activities. TaskRabbit is not the only platform of its kind, and new ones sprout up all the time. While many of these companies offer some amount of insurance (for example DogVacay provides veterinary coverage for "Guest" dogs), the limits, deductibles, exclusions and claims processes will vary. And some platforms might provide no coverage at all. It's crucial that you understand what, if anything, is covered so that you avoid putting your personal assets on the line as the result of an uncovered claim against you. And remember, regardless of the insurance coverage the company may provide, you could still be sued (either in addition to the company, because the company has denied the claim or because the losses exceed the company's coverage limit). When you're the client: You might be covered for damage or injuries caused by the person you hire under insurance or a "guarantee" provided by the company that brokered the gig. For example, according to the company website on 4/10/17, under the TaskRabbit Happiness Pledge, the company will compensate clients up to $1,000,000 per loss for property damage as the result of a tasker's negligence or up to $10,000 for theft of property by a tasker, or up to $10,000 for bodily injury sustained by a user and caused by another user. Claims have to be filed within 14 days of the task and not fall under the laundry list of excluded losses. This coverage is secondary, which means that it would kick in only after your own insurance pays up to its limits or denies the claim. Check with the company you use to connect with clients or workers regarding the coverage it offers users, if any. If the person you hire gets injured in your home as a result of negligence on your part, your homeowners or renters insurance should cover the claim. That's also true if, say, your dog bites someone while being walked on leash by your DogVacay sitter, assuming there was negligence on the sitter's part. While most homeowners purchase insurance because it is required by their mortgage lender or they have a significant amount of home equity to protect, the majority of renters don't have coverage. Renters insurance can typically be had for as little as $15 per month for a basic policy. If you don't have homeowners or renters insurance, you could be left holding the bag if the claim isn't covered by someone else's insurance (the intermediary company, for example). If you are a renter, your landlord's insurance policy does not cover your personal property or liability claims against you. A P2P marketplace is an online venue for connecting people who need/want something with people who have things to sell and/or rent. For example, Etsy is a well-known P2P marketplace for homemade goods, from clothing, jewelry and soap to décor, furniture and toys. The platforms for lending/borrowing or renting things such as tools and sports equipment are much smaller, but they do exist. When you're the seller/owner: Examples of what could go wrong when you sell your wares include a baby choking on loose threads from the crib quilt you sewed, someone having a severe allergic reaction to the undisclosed metal you used in the earrings you made, or someone's dog getting sick from the biscuits you baked. Injuries to buyers are not the only risks. For example, your garage burning down because the laser equipment you use started a fire, or the UPS driver tripping on your carpet as he picks up the orders you're shipping out, are other "perils" (insurance company lingo for risks). Examples of what could go wrong when you rent out your equipment include someone falling off your ladder because of a broken step or someone getting a head injury because your helmet was ancient and no longer protective. Generally speaking, the typical homeowners or renters insurance policy would not cover claims against you resulting from business pursuits, which includes selling or renting products, belongings, etc. It's possible that, depending on what you are selling or renting and how often you do it, the insurance company that carries your homeowners or renters policy would add a rider to provide such coverage. As always, the best way to be sure about what coverage you need is to consult with your insurer and be upfront about what you are selling or renting, to whom, how often, what special equipment you might be using to produce products in your home, what inventory you store, who visits your property to make purchases or deliveries, whether you hire help, etc. It's possible that the platform you use might offer some type of insurance or guarantee for things like lost or damaged orders, or damaged or stolen rental items. But you're unlikely to get any liability coverage through an intermediary. If someone is going to sue for damages or injury caused by something you produced or rented to them, you will almost certainly be on the hook. Without your own insurance coverage—whether through a rider to your homeowners or renters policy or through a separate business or product liability policy—your current assets and future earnings could be at stake. When you're the buyer/renter: As always, try to do business with trusted merchants. If you are considering purchasing or renting from an unfamiliar person or company, check online reviews and do an internet search to learn as much as possible before making a transaction. Be aware that just because people who sell or rent things to the public should have liability insurance doesn't mean they do. That could leave you (and/or your insurer) holding the bag if you were to suffer injuries or damage. Do know your state's laws. For example, some states, such as New York, require ridesharing and delivery drivers to have a commercial insurance policy, and might require a commercial driver's license. To find out exactly what your state requires, contact your state's insurance department and department of motor vehicles. If you do not comply with licensing requirements, your insurer could deny your claim and/or you could be prosecuted if you were to get into an accident. Do check with your insurer to confirm what is covered and what isn't. For example, if you've dropped collision and/or comprehensive coverage on your own personal auto policy, you may not be covered if the auto you rent through a P2P carsharing platform is stolen or damaged. If you don't own a car, some experts recommend that you purchase non-owner liability insurance for added protection. Do consider all types of insurance you might need. Although it has been challenged legally, generally speaking, the companies that provide the technology to connect you to your passengers, clients or customers treat workers as independent contractors rather than employees. As an independent contractor, you wouldn't be eligible for workers compensation if you got hurt while performing your work, or for unemployment insurance if your gigs dried up. You would also be responsible for your own health insurance. 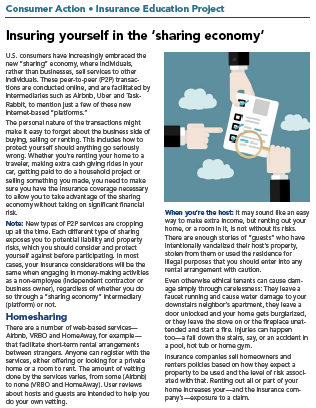 Do be honest with your insurance company or agent about your plans to make money in the sharing economy. This will help you avoid an uncovered loss or the cancellation of your policy if, say, you tell them you only rent out your home a couple of weekends a year and they find out you have paying guests much more frequently. Don't assume that you are covered for every type of loss. Damages that might not qualify as covered claims can also occur—a renter introducing bedbugs into your home, for example. Costly and/or inconvenient problems that are not covered by your personal policy or protection provided by the intermediary (platform) are something to consider before participating. Don't inadvertently allow your paying guest to establish tenant rights. For example, in San Francisco, renters gain tenancy in an apartment by living there for more than 30 days. If they decide not to leave after that, you would have to go through the formal eviction process to get them out of your home—even if they've since stopped paying rent. Don't wait until after you have opened yourself up to liability to find out what coverage you do—or don't—have.